In the last year I've collected some new tools. You've probably had them, or something similar, in your knitting bag for ages, but they're new to me so I thought I'd spread the love. I can't even say how nice it is to have tiny doublepoints all matching and packaged together when I want to knit a sleeve or sock. I had been using a franken-needle set I'd thrown together when I couldn't find matching ones. It included a mix of metal, bamboo, lace tips, regular tips, long, and short needles all used at once on one sleeve. Sometimes I'd throw a short circular in there too. So having a set of Sunstruck DPNs in multiple sizes must be what being rich feels like. 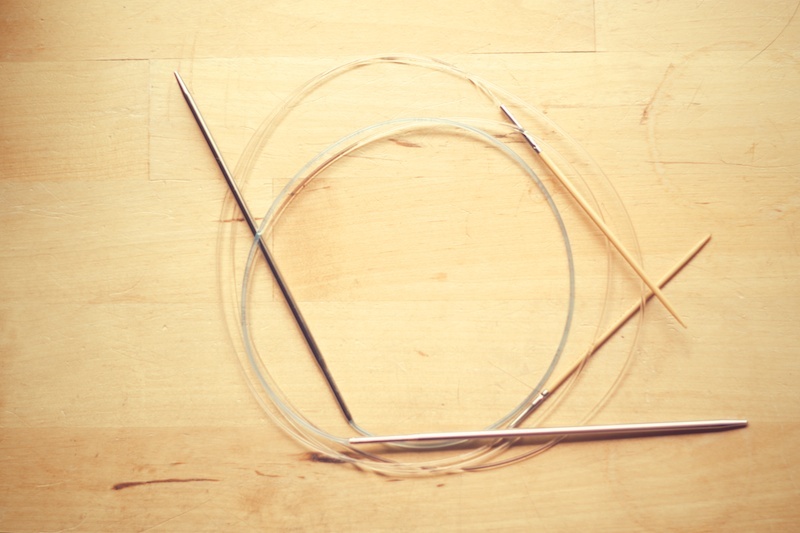 My husband gave me some 24" Addi Turbo circulars for Christmas to round out my tiny needle collection. I knit very loosely, so I rarely use anything above a 3. I'm sure there are lots of great circular brands out there, but I have a fondness for these. They take my abuse. One pair is dented and slightly bent where bamboo or acrylic would have snapped instantly. I did get some inexpensive Clover bamboo circulars at the hobby store in super long lengths for using magic loop, though. My children gave me a couple of Snapware yarn buckets for Christmas in lieu of yarn bowls, which is probably wise considering the way my cat and dog gallop past me as I knit, the cat landing more heavily than the dog. If you're a knitter, you can see the obvious downside to these: once you feed the yarn through the hole, it has to be cut to get it out. That doesn't make for a super portable project. But I've found if I just leave the lid cracked and let the yarn through it, it works great for me. I can then take it out to travel with my project and dump it back in when I get home. They will also be helpful when I have two colors working at once. Besides that, there is cat and dog hair everywhere in my house and these limit my yarn's contact with it- at least, until I wear the finished item. Speaking of being hairless and clean, I finally bought some Soak, and though I haven't used it yet, I'm very excited about it's no-rinse nature. 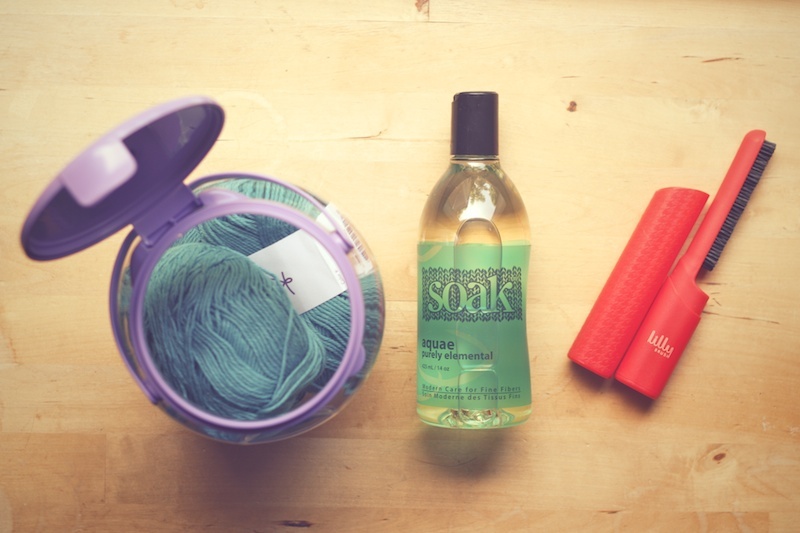 Along with that, I have a Lilly Brush for removing the pet hair and pills from the elbows of my sweaters. Could it be that I will look less schleppy in the near future? Maybe. I have been using some very pretty stitch markers from Cherry Tree Stitches that I won in the Downton Abbey KAL earlier this year. 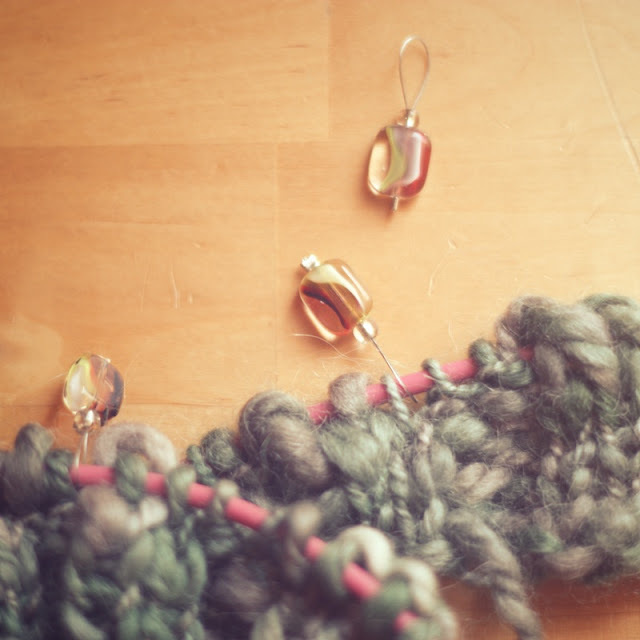 The wire works so well without stretching tiny stitches, plus it's the knitting equivalent to putting on a pair of earrings. It bumps things up a notch. Thank you so much for the montion of my Etsy Shop. I love stocking up on little knit-related gadgets. 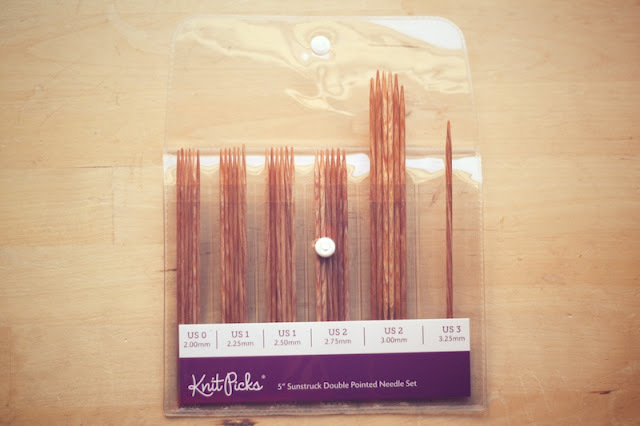 I am curious to know you the Sunstruck needles feel once you start working with them! The little jars are hilarious!!! You're welcome, Ashley. I should've sooner, but these photos have sat on my computer for too long while life got a little crazy. Oh, but I'm not! These things are coming ten years into the knitting habit, plus right now my current project is tangling in a ziplock in a backpack. But, I'm trying. I really like the sun struck needles, Monica. They aren't as slippery when I am knitting a sleeve with metal dpns and I appreciate not having the needles slip out of the stitches constantly. I still think I prefer magic loop, but I go through phases where I like one or the other.